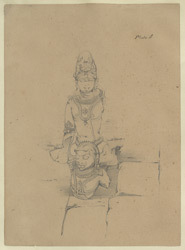 Pencil drawing by Frederick Charles Maisey of a broken sculpture of Kubera riding on his vehicle from the Nilkanth Temple at Kalinjar, from an album of 60 drawings, dated 1847-1854. Kalinjar, one of the oldest hill forts in India, occupies a remote site on the last spur of the Vindhya Mountains above the Gangetic Valley, a plateau 375 metres high. The site was originally a revered hill shrine later fortified and occupied by successive generations of invaders. From the 9th to the 12th centuries it was a stronghold of the Chandellas. In 1023 Mahmud of Ghazni attempted to seize the fortress but failed. In 1203 Kalinjar fell to the Muslims under Qutub-ud-Din Aybak who defeated the last of the Chandella rajas, Parmadideva. The fort was sacked and all the temples were destroyed. A few centuries later, with the rise of the Mughal Empire, a new series of attacks took place. Emperor Humayun attacked the fort many times from 1530 to 1545. In 1545 the Afghan Sher Shah beseigned the fort but was mortally wounded during the battle. When Humayun re-established Mughal rule in India the forces of his son Akbar took Kalinjar in 1569. In 1812 the fort surrendered to the British under Colonel Martindell. The fortifications were dismantled in 1866. Within the fort there are numerous archaeological remains. From a gateway in the preserved inner curtain wall two flights of steps lead down to Kalinjar's holiest shrine, the Nilakanth Temple. There are numerous inscriptions and rock carvings on the way down to the shrine and masterpieces of Chandella sculpture. A wonderful lifesize dancing Ganesh wearing ankle bells is carved onto a pillar in a doorway. Outside the sanctuary there is an hexagonal mandapa or pavilion; this is now roofless but its finely carved pillars ahve preserved their mouldings and capitals. Inside the cave there is the blue stone lingam with silver eyes, venerated for more than 1000 years. In the Description of the Antiquties of Khalinjar of 1848, Maisey wrote that this drawing represents, "...Kuver, the Hindu Plutus; riding on the shoulder of his vahan, a man...The sculpture is 3 feet 6 inches high; it is let into the wall and has evidently been brought from elsewhere."